Today, what remains of the pan-Shiite National Alliance formally presented Haydar al-Abbadi of the Daawa party as their PM candidate. 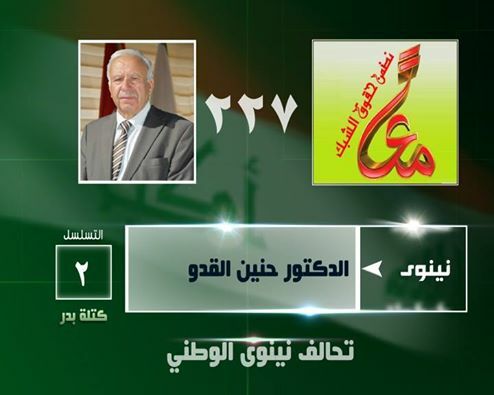 Abbadi will be charged by President Fuad Masum to replace the current PM, Nuri al-Maliki. The political realities behind this move can be summarized as follows. For some weeks, pressure has been building inside Maliki’s State of Law coalition to have him changed. Finally today, factions led by Haydar al-Abbadi of the Daawa and Hussein al-Shahristani, the current deputy PM, broke with Maliki to nominate Abbadi for PM. Early reports suggests 38 Daawa MPs and 12 members of the Shahristani bloc abandoned Maliki, leaving him with the backing of only around 45 members of the original 95-member State of Law bloc. It is worth noting that the traditionally pro-Iranian Badr organization has not been enumerated among the 128 or so supporters of Abbadi. Constitutionally and legally, today’s developments also clear the air. Until yesterday, Maliki could plausibly plead the case that the president should have charged him with forming the government before the official deadline expired. However, today’s action by the Shiite alliance showed that Maliki’s claim to represent the largest bloc no longer has any basis, because State of Law has disintegrated. The focus on the first session of parliament in the ruling of the federal supreme court from 2010 has now been superseded by events, and in any case was not based on the Iraqi constitution itself. It only reflected the opinion of the court. Accordingly, Maliki’s promise to bring the case before the Iraqi federal supreme court will be of academic interest only. Any attempt by him to challenge the nomination through other means than the court will be profoundly anti-democratic. Haydar al-Abbadi is a former finance minister who is well liked by groups outside the Daawa and State of Law, who elected him as deputy speaker for the new parliament earlier. He will now have 30 days to present his cabinet for approval by the Iraqi parliament with an absolute majority. There was both irony and symbolism in the air as UN Secretary General Ban Ki-moon visited Iraq today. In his address upon arriving, Ki-moon highlighted the importance of the Iraqi parliament adhering to constitutional timelines for forming the new government. For its part, apparently unaware about the visit, the Iraqi parliament was already in session. In order to accommodate Ki-moon, it had to postpone its planned vote on a new president by more than an hour. Once the voting got underway, things went rather faster than expected. Parliament speaker Salim al-Jibburi announced that a committee had considered more than 100 candidates and made some disqualifications based on formal criteria such as age, education and de-Baathification status. He then proceeded to call a vote on several dozen candidates. There is a case to be made that the way the election was carried out was illegal. This is so because the law on presidency candidates distinctly stipulates that rejected candidates, of which there were several, have a 3-day right of appeal to the federal supreme court. This was not honoured. Sadly, during the procedural discussion prior to the vote, Iraqi MPs wasted their time on political arguments instead of these important legal questions. As for the speaker himself, maybe it was too much to expect that he should take any interest in putting the law above the interests of big political parties since he himself acquired his seat in the previous parliament in an illegal fashion in 2010? And given that Jibburi is a darling of the US embassy, it would perhaps be too much to expect them or the UN to care about these little details of legality. What happened instead was that a first vote was held in which the candidate of the unified Kurdish blocs received 175 votes – convincing and indicative of the broad political consensus that was also achieved when the new parliament speaker was elected, but of short of the 218 absolute-majority required for the president in the first vote. The second best vote-getter was Hanan al-Fatlawi of the bloc of Prime Minister Nuri al-Maliki, who had launched her candidacy “in a personal capacity”. She got 37 votes, whereas several other candidates got a handful of votes each (no verified statistics are available since the Iraq parliament website remains offline). Following rather unseemly interventions by Shiite alliance figures Ibrahim al-Jaafari and Baha al-Aaraji, Fatlawi was intimidated into withdrawing her candidacy. The third best vote-getter, Faiq al-Sheikh Ali also withdrew, leaving it to the judge Hussein al-Musawi, who also challenged Talabani in 2010, to stand against Masum in the largely ceremonial second vote (since he was absent from parliament, he was unable to withdraw). Of course, the optics of all of this represented a miserable rupture with positive tendencies in the direction of more mature, non-sectarian politics seen in the run-up to the presidential vote. There was something distinctively impotent over the way presidential candidates gave inspired speeches defending their choice to stand as candidates in a protest against the ethno-sectarian spoils system, only to withdraw and leave the field open to the candidate largely decided by one of the Kurdish parties (PUK) in its closed meetings. Iraq is now actually ahead of the constitutional timeline for forming its next government. But the potentially most problematic task remains: Agreeing on a prime minister. The president has got 14 days to nominate the PM candidate of the largest bloc in parliament, and exactly like in 2010 there are questions about the identity of that bloc and its candidate. In general, much of what has been said publicly about this matter has been futile. The opinion of the new parliament speaker has been quoted, as has the federal supreme court – with claims and counterclaims about its position. The truth is, it is for the new president to identify the largest bloc and ask its PM candidate to form the next government. Whereas the pan-Shiite alliance has declared itself the largest bloc repeatedly, there is a case to be made that as long as it does not have an agreed PM candidate it doesn’t exist in a way that is interesting to the Iraqi government formation and that the State of Law bloc of PM Maliki – whose candidate is Maliki – is the biggest bloc. It is being reported that Masum will meet soon with the Shiite alliance to clarify these things. Unless a PM candidate emerges, Maliki could legitimately complain to the federal supreme court that Masum is wasting his time with a non-existent political alliance. One additional interesting aspect of today’s sessions: Iraqi MPs apparently forgot about ueseless vice-presidential positions altogether! Hopeully the PM question will now remain their preoccupation. Following positive developments in the Iraqi parliament and the election of a speaker before agreement was reached on other leadership positions, it is more difficult to evaluate the posturing for the next constitutional step: The election of the largely ceremonial office of president of the Iraqi republic. For starters, one very key source has been missing for days: The Iraqi parliament website is offline, apparently due to a site subscriber or maintenance issue, or potentially to do with a hacker attack. This prevents insights into the details of the ongoing process of nominations to the presidential post. According to the law on candidacies for the Iraqi presidency, candidates are to submit their credentials within 3 days of the election of the speaker, whereupon the speaker has got 3 days to vet them for formal criteria (age, education, de-Baathification status etc.) before a 3-day appeals window for any candidate excluded during the initial part of the process. With reports about a large field of candidates, it is very hard to see how due process can be adhered to if an attempt to elect the president will go ahead on Wednesday, as press reports suggest. The legal adviser of Prime Minister Nuri al-Maliki, Tareq Harb, has suggested that adherence to the timelines of proper vetting and appeal possibilities would take us to August before the president could be voted on. By way of contrast, though, at a presser today, the new parliament speaker, Salim al-Jibburi, nonetheless seemed to indicate that a vote would go ahead, which seems legally problematic. Beyond the legal aspects, there are potential procedural and practical problems relating to the election of the next president following the explosion of the number of candidates this year. In 2006, Jalal Talabani was the only candidate. In 2010 he was challenged by a judge who presented himself as candidate in protest against the ethno-sectarian spoils system. This year, more than 100 candidates have reportedly registered. As a minimum, a vote on the president should feature a brief presentation of each candidate, meaning the presentation of candidates alone could go on for many, many hours. And we have not even talked about vice presidents yet. Of course, in general terms, the multiplication of presidential candidates seems to be a good thing for Iraq’s democracy. There has been a stark contrast between the official discourse of a contest that is open to all (with potential contestants ranging from those who protest the ethno-sectarian spoils system to those who think the presidency should go to particular ethnicities), and what many believed was the real decision-making process: A debate about which member of the Kurdish PUK party should have the job, maybe with the president of the Kurdish region as supreme arbiter. Eventually, though, even the PUK came up with more than one candidate as both Fuad Masum and Barham Salih registered for potential election. In general the greater openness seems to have a liberating effect on Iraqi politics – if only Iraqi politicians can manage to find a way of getting the formalities right for the much larger field of presidential candidates than usual. A world without Usama al-Nujayfi, Ayyad Allawi, Ammar al-Hakim and Mutqada al-Sadr. Surely that must be one of the most pleasant dreams that could happen in the head of Iraq’s prime minister, Nuri al-Maliki these days? In fact, given political developments during the weeks since the announcement of the uncertified election result, Maliki has quite good chances for such a dream to become reality. Crucially, though, that dream would have to include a personality Maliki probably would have preferred to shut out along with the others: Masud Barzani, the president of the Kurdish federal region. What has happened is as follows. In the uncertified election result there were 92 straightforward State of Law winners and another 3 State of Law affiliated people running on various pan-Shia lists in the Shiite-minority provinces in the north. Subsequently, Maliki has been formally joined by smaller Shiite parties such as Solidarity in Iraq (1 seat in Dhi Qar), the Just State (1 seat), Professionals and Masses (2 seats), Loyalty to Iraq (2 seats in Najaf). Additionally, support for Maliki from the Sadiqun movement affiliated with Asaeb Ahl al-Haqq (1 seat) is a foregone conclusion since probably no one else wants to have anything to do with that controversial movement. That’s 102 seats. For their part, the combined parliamentary strength of the Kurds is mostly assessed to be above 60 seats, certainly if pro-Kurdish minority representatives from the north are included. Accordingly, Maliki and the Kurds are now so close to securing the absolute majority needed to seat a new government (165 seats) that it would be very easy for them to secure a few extra MPs without having to involve any other big bloc. Also, by virtue of their relatively disciplined parliamentary contingent, the Kurds are probably in a better position to deliver actual votes to Maliki in parliament than any combination of smaller Arab-dominated parties would be able to. All of this is different from 2010, when State of Law plus the Kurds would have fallen short of 163 votes, the absolute-majority mark in the 325-member parliament back then. This scenario offers a potential negotiation dynamic that is very different from the outcomes that have dominated the discussion thus far – i.e. a political majority government of pro-Maliki centralists against decentralizers among the Kurds, ISCI and Nujayfi; or a quasi political-majority government of Maliki and at least one of the big parties (Nujayfi, Allawi, Hakim, Sadr) that would be prepared to join him bilaterally in opposition to the others; or an anti-Maliki coalition along the lines that challenged him in the first part of 2012; or a decision on the next PM inside a reconstituted grand Shiite alliance, perhaps followed by another oversized partnership government. Nonetheless, despite all the talk about these scenarios (and perhaps a revived Shiite alliance in particular), the only thing that has actually happened on the ground since the election result was announced is that State of Law has continued to grow steadily, attracting also some parties with more secular leanings that wouldn’t fit particularly well in the Shiite Islamist National Alliance at all. Indeed, it is likely that such smaller parties on the Sunni side could also be subsumed by the State of Law alliance. It is noteworthy that despite the strong regional tensions, parties favouring dialogue with Maliki instead of maximizing the sectarian conflict won multiple seats in key Sunni governorates such as Anbar. Indeed, it could be argued that the vote for the smaller pro-sahwa lists and the secular Iraq coalition in Anbar – altogether 130,000 votes and 6 seats – was a vote in favour of rapprochement with Maliki. If movements like these get included in the next Iraqi government, the contention frequently seen in Western media to the effect that “Iraqi Sunnis lost the elections” would lose even more of its limited relevance. True, the option of Maliki’s enemies forming some kind of grand coalition against him still exists, but with Maliki’s recent growth they are running out of time: Once Maliki reaches around 125 deputies, it will be near mathematically impossible for his adversaries to form a bigger parliamentary bloc without the Kurds. With trends like these, the chances of Maliki acting bi-laterally instead of multi-laterally in the government formation process certainly go up. Of course, the Kurds will not sign up to a a third Maliki premiership just for the sake of forming a slimmer government. Like in 2010, they will have specific demands, including the general relationship between Baghdad and the Kurdistan federal region, oil policy issues, payment for Kurdish armed forces as well as disputed areas. There are key differences from 2010, though. Firstly, the Kurdish demands have grown more radical. No longer are questions about the validity of contracts of foreign oil companies most prominent on the agenda. The Kurds have recently opened up separate pipelines to Turkey and want Baghdad to approve this move without any interference. Second, the Kurds have already seen what happened with lofty promises in the Erbil agreement of 2010, which largely remains unimplemented. Surely they will fashion their demands to Maliki in ways that can prevent a repeat of that disappointment this time. In practice, it will not be too difficult for Maliki to reverse much of his anti-Kurdish political majority rhetoric if he instead can form the new government on the basis of some kind of landmark agreement with the Kurds that can lead to satisfaction on both sides. 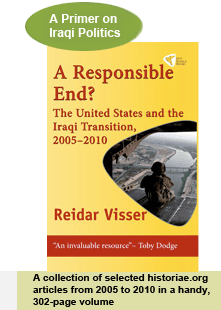 The problem though, given the increasingly radical nature of the Kurdish demands, is to find concessions that are in the spirit of the Iraqi constitution of 2005 as a union between Iraqis, rather than practical guidelines for the implementation of a divorce. Some such potential concessions within the framework of a federal state still exist. Firstly, there are things Maliki could offer on disputed internal boundaries that would involve one-off concessions to the Kurds in some of the less disputed of the disputed territories in the north, though without Kirkuk and a comprehensive article 140 settlement (which is likely to take many years to be implemented even under the rosiest of circumstances). Second, there is the recurrent issue of payment for the Kurdish security forces. Since these forces also serve in domestic and internal roles, their payment over the federal budget is not particularly logical. Still, if such an arrangement can serve as glue in the Iraqi federation, it is far better than deals that would remove the oil sector entirely from Baghdad’s sphere, effectively making Kurdistan an independent country but without a suitable legal and constitutional framework. Thirdly, there are the oil contracts with foreign companies operating in Kurdistan, which Baghdad have yet to formally approve. It could be argued that one-off approval of these contracts could be a suitable concession if an appropriate framework for cooperation for future foreign contracts could be established as part of the compromise. All of the above are compromises that would retain the essence of the Iraqi constitution of 2005 and would be sellable also to Maliki’s domestic audience (which should not be forgotten after they gave him more than 700,000 personal votes). Above all, though, if Maliki and the Kurds want to cut a separate deal, it is important that both sides exercise realism in order that another Erbil paper tiger, and the concomitant dysfunctional government it produced, can be avoided. In its process of reviewing complaints following the publication of the uncertified elections result, the Iraqi elections commission IHEC has taken the unusual step of publishing data for the special vote for the Iraqi security forces that took place days before the 30 April general elections. In releasing this data, IHEC is presumably responding to a flurry of rumours regarding potential corruption and vote buying for the security forces vote (which amounts to almost 1 million votes and is thus bigger than the expat vote and many governorate votes). The released data has the form of percentages of the special vote for the main winning lists per governorate. This can be tabulated with the percentages for the total vote as indicated in the second row for each governorate below. It emerges from this tabulation that the special vote differs significantly from the general vote only in a few provinces. 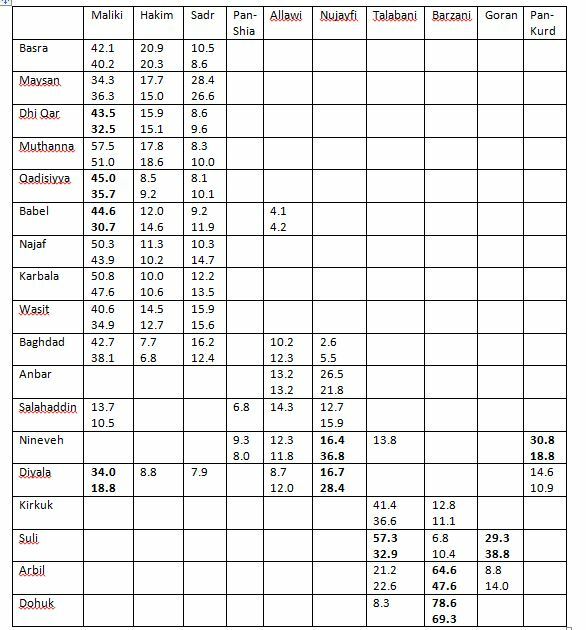 Firstly, there is slightly elevated support for PM Maliki in a number of Shiite-majority provinces, including Dhi Qar, Qadisiya and Babel. This is mostly in the 10-15% range and as such may not be anything than an expression that this is a special segment of the electorate where affection to the commander in chief may be expected to be elevated compared to the general population. A similar situation with a potential explanation relating to the Kurdish peshmerga security forces relates to Dahuk. Second, there are provinces where the special vote differs significantly from the general vote. This includes Diyala (Maliki has almost doubled his percentages whereas the pro-Nujayfi list has its share reduced to the half); Nineveh (where Nujayfi again has only half the percentage of vote in the special votes whereas the Kurdish vote is doubled): Sulaymaniya (where PUK has enormous gains compared to Goran in the general vote); and finally Arbil (where the same phenomenon albeit on a smaller scale relates to the KDP-Goran balance). It has already been suggested that the Kurdish parties applied pressure to their security forces to vote for them, which could explain the dismal Goran performance in the special vote. The surge for Maliki in the Diyala special vote needs explaining, and it will be interesting to see what IHEC may come up with in this respect. In seeking to address concerns about possible ballot-stuffing in the “Baghdad belt” IHEC has also released individual tallies from the counting centres in that area. The truly hard question, though, is to what extent these numbers will be used to affect and change the final result when it gets sent to the supreme court for certification, hopefully within a few weeks. The uncertified result of Iraq’s parliamentary elections, released by the election commission today, cannot be described as anything other than a victory for the incumbent prime minister, Nuri al-Maliki. Compared with 2010, Maliki increased his share of seats in the Iraqi parliament from 89 to 94. This quite despite the fact that Maliki experienced numerous defections from his list before the elections and therefore fielded a much slimmer electoral coalition than in 2010. His success can hardly be translated as anything other than an indication of his continued popularity among voters despite growing unease about his rule among political opponents. Not only did Maliki manage to increase the size of his parliamentary contingent. His political enemies also look far more fragmented than before. In the Shiite camp, the Sadrist saw their bloc reduced by about a quarter of its previous size, whereas ISCI, despite making something of a comeback, was unable to garner more than 30 seats. Among the Sunnis, parliament speaker Nujayfi failed to emerge as the community leader he had been dreaming of, with Shiite secularist Ayyad Allawi continuing to appeal to secularists of Sunni and Shiite backgrounds alike. Even the Kurds have seen a greater degree of formal fragmentation than before (though a theoretical combined bloc strength of more than 60 seats is possible if they stay united and win over minority representatives as in the past). All in all, the group of parties that were on the verge of succeeding with a vote of no confidence against Maliki in 2012 now look weaker. The question now, however, is what Maliki can do with this impressive victory. Prior to the elections, a main debate was whether the next Iraqi government should be a power-sharing or a majority one. Maliki has been vocal in his expression for a smaller, majority government. Theoretically, he can also achieve it with these results, albeit not very easily. If Maliki stayed true to the “political majority” concept, it would involve gathering blocs that agreed with his vision of relatively centralized rule in Iraq, including a degree of central control of the oil sector throughout the country including Kurdistan. In theory, this could involve his own bloc, the Sadrists, smaller Shiite parties (Jaafari, Fadila, Sadiqun etc. ), the Sunni party of Saleh al-Mutlak, parts of the Allawi list, as well as the many smaller minority and other lists (an unprecedented mass of some 40 deputies) that could help him reach the 165 absolute majority mark needed to form a government. In practice, though, the personal dislike of Maliki among many Sadrists and members of the Allawi list could make this prospect very difficult. Without them, his majority would be extremely slim, fragmented and vulnerable. 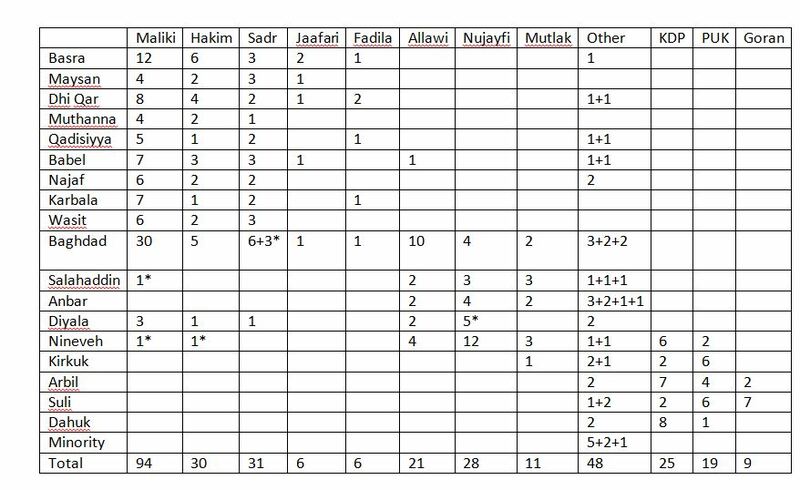 The point is, though, that with numbers like this, Maliki is likely to try hard to form some kind of majority government before considering other alternatives. One possibility he is likely to try is to redefine “political majority” in a looser, more opportunistic way, involving basically a Yes to a third Maliki term. With the right kind of deal he might be able to get the Kurds on board for this, thereby succeeding in keeping Shiite enemies – and Ammar al-Hakim in particular – on the sidelines. The problem, of course, is that much of Maliki’s political majority rhetoric centred precisely on defending the prerogatives of Baghdad with respect to controversial issues relating to foreign oil companies operating in Kurdistan. Given these potential complications, it cannot escape notice that, in an unprecedented situation, the combined Iraqi Shiite Islamist parties now enjoy a theoretical option of forming a majority government. Together they have more than the 165 votes required for an absolute majority, meaning the question of reconstituting the pan-Shiite National Alliance will inevitably hit the agenda if Maliki fails in his other efforts. Indeed, such movements are already underway, and they could certainly gather steam if Maliki’s majoritarian dreams go nowhere. It has to be stressed though, that with Maliki’s strong showing in these elections compared with everyone else, the option of simply substituting him with someone more palatable to the Hakim and Sadrist camps is less relevant than it was prior to the elections. If everything else fails, Iran may well want to strongarm the Sadrists into accepting a third term for Maliki, which would have a reasonable parliamentary prospect with or without Hakim. It could also invite larger numbers of Kurds and Sunnis in, in which case it might well end up looking somewhat similar to the previous, oversized power-sharing governments formed in 2006 and 2010. Meanwhile, the election result will be submitted for legal certification. In 2010, that process lasted more than 2 months, significantly delaying the process of government formation. Symptomatically, ISCI has already signaled that it may challenge the counting of the votes – something which will certainly not do anything to bring them closer to Maliki in the short term. Until now the struggle over the 2014 Iraqi budget has mainly shaped up as a conflict between the central government and the Kurds. The Shiite parties have generally supported PM Maliki, with the Sunni Nujayfi bloc forming the main support for the Kurds outside their own parties. In a remarkable press statement, Baqir al-Zubaydi of the ISCI bloc in parliament has claimed that the reason quorum was not achieved on Sunday was the large number of absent MPs from the Sadrist and State of Law blocs. Claiming that all of ISCI was present, Zubaydi says that altogether 147 deputies attended, missing the quorum by 16. Other sources say only 48 of the around 90 State of Law deputies attended – around half of the bloc. Similar percentages of absentees were reported for the Sadrists whereas it was claimed that Badr showed up in full force alongside their former ISCI allies. So far, the State of Law deputies have been in the forefront in calling for the annual budget to be passed. The reported number of absentees is larger than what can plausibly be reduced to practical and logistical problems, even by Iraqi standards. With the electoral campaign ahead of the 30 April elections starting this week (and the conflict over IHEC reportedly solved after Nujayfi backtracked from his original position), they may have some major explaining to do to their electorates if they continue to stay away from parliament in the way claimed by their political opponents.